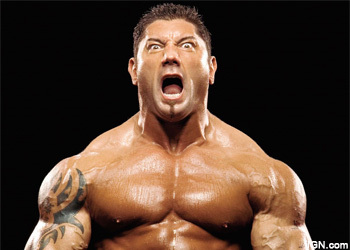 Early Monday morning former WWE champion Batista told TMZ that he had already signed with Strikeforce. However, later that day we learned through a Strikeforce official that no such deal had been inked yet. “The report is not correct. Batista is not signed,” Mike Afromowitz told 5thRound.com. Now the gossip site is reporting that both parties have had formal discussions about bringing the pro wrestler into the cage, but that Batista’s terms are currently too optimistic. Apparently, Batista is asking for more than Strikeforce is willing to pay him at the moment and his schedule is a concern as well since he’s booked with TV and movie appearances following the expiration of his wrestling contract. Clearly he’s banking on his star power carrying over from the WWE to MMA, which would generate some money for the California-based promotion. Keep in mind that Strikeforce already has another former pro wrestler under their banner in Bobby Lashley and would most likely be hesitant to sign him for anything more than they are already paying Lashley, who at least has a couple of fights under his belt already. Batista had already begun training mixed martial arts during his WWE contract in preparation for a potential bout, but unless his terms fall in line with what Strikeforce is willing to shell out, no deal will come about.